Anyone who has seen the promotional video for the Oculus Rift Kickstarter project might have noticed that two well known personages from cloud gaming company Gaikai are prominently featured among the endorsements, them being chief product officer of Gaikai and former Scaleform co-founder and CEO Brendan Iribe, and Scaleform's former co-founder and chief technology officer Michael Antonov who was brought over to Gaikai by Brendan Iribe. If you haven't seen it, you can also watch the video at the end of the article. 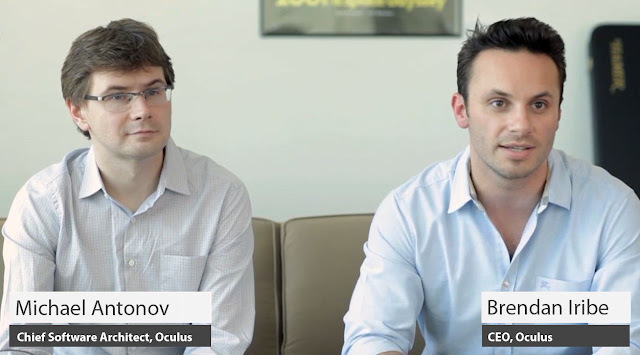 Seeing how excited Brendan Iribe was in the promotional video for the Oculus Rift, it's no wonder that he has now left Gaikai to work for Oculus and again took his good friend Michael Antonov with him. Brendan Iribe has joined Oculus as CEO. Michael Antonov will work at Oculus as chief software architect. Joining them will be Jack McCauley as vice president of engineering. In 2004, Brendan Iribe and Michael Antonov co-founded Scaleform, a developer of UI middleware for video games. Scaleform was eventually acquired by Autodesk in March of 2011, but not before seeing its award-winning software development kit (SDK) included in over 1000 high end video games. After overseeing the transition to Autodesk, Brendan moved on to Gaikai as the chief product officer leading the user experience and product development teams. He now lends his deep industry experience and knowledge of gaming technology to Oculus and its VR product, the Oculus Rift. Joining Brendan are two other veterans of the game technology space. Michael Antonov was CTO at Scaleform and software architect at Autodesk, and now comes on board as chief software architect, responsible for the Oculus SDK. Jack McCauley comes to Oculus from R0R3 Devices, a product engineering company, where he led the development and manufacturing of numerous popular video game peripherals including Activision’s highly acclaimed guitar and drum controllers, which shipped millions of units worldwide.